Skip the fat- and sugar-filled frappe and opt for this protein-fueled dark chocolate mocha instead! If you live in the northern hemisphere, you don't need me to tell you that winter's on its way. Temperatures are dropping, and they're dropping fast. You probably feel it every morning when you jump out of bed and pack up your gym bag. That's why I created this concoction: to help you deal with the transition from cool to freezing a bit better. 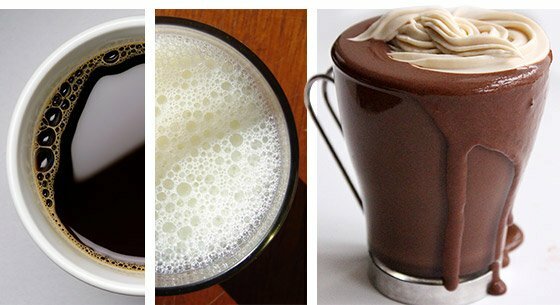 Here's my favorite recipe for a dark chocolate protein mocha. It's a combination of a dark hot chocolate, a hefty punch of coffee, and some good old-fashioned protein pow! I've also included a few recipe variations so you can adapt it to fit your macros and flavor preferences. Ready? Let's go! If chocolate isn't your thing, opt for vanilla casein for a familiar, smooth finish. Add some butterscotch extract to your drink for another flavor dimension. If you're feeling seasonal, why not substitute the cocoa with pumpkin puree, use vanilla instead of chocolate casein, and add some pumpkin spice for a protein-powered pumpkin spice protein latte? It sure beats the calorie-bomb version you'll find at your local coffee house!